Finance your dream home in St. Louis & St. Charles Counties Imagine buying your dream home. Connect with a lender to help you make it happen. Hello and congrats on taking your first step to buy a home – how exciting! My name is Melisa Jones. I’m a mortgage and home loan professional and I would love the opportunity to chat with you! With a background in education, and over 11 years’ experience in the mortgage industry, I love helping people buy homes and educating them about the process so you can make the best financial decision. Me and my team of experienced professionals are committed to fast, efficient, courteous and personal service to help you understand and feel at ease throughout the home buying process. Our trained and certified loan originators specialize in financing homes in the St. Louis & St. Charles Counties area real estate market. We are prepared to find the right loan program with competitive rates and low down payments for you. 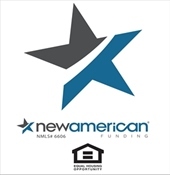 New American Funding has paid a fee to appear as one of the lenders advertised on this website. Please do not submit any confidential information. This will be shared with both New American Funding and Keller Williams Realty West. Let me know how I can assist you with your St. Louis & St. Charles Counties mortgage needs. I am here to help!